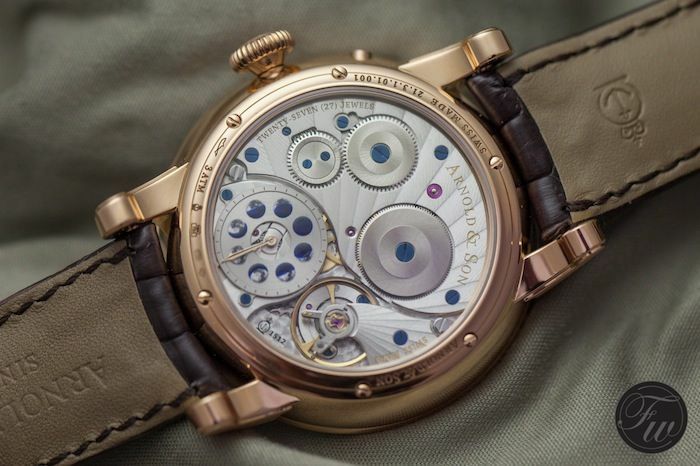 Arnold & Son was one of the biggest surprised for me at this year’s Baselworld. The timepieces showcased to us by one of their master watchmakers were both from Arnold & Son’s Instrument and Royal collection. Let us start by showing you the Arnold & Son HM Perpetual Moon timepieces from the Royal collection. In this article, we feature both the blue guilloché dial version in red gold as well as the silver guilloché dial in stainless steel. That’s right, this watch will also be available in stainless steel. Last but not least, there is a red gold version of the HM Perpetual Moon timepiece with a beautiful cream coloured dial with a translucent blue lacquered guilloché Moon disc. Instead of discussing the beautiful dial, hands and Moon disc first, we zoom a bit into the beautiful decorated and designed movement. The Arnold & Son HM Perpetual Moon is not only a feast for the eyes, it is also a wonderful example of fine traditional watchmaking. Often, we see beautiful watches with only little effort and interest in the mechanical watchmaking and vice versa. Beautiful technical pieces that lack a well designed case, dial, hands and so on. It seems that Arnold & Son has it all under control. 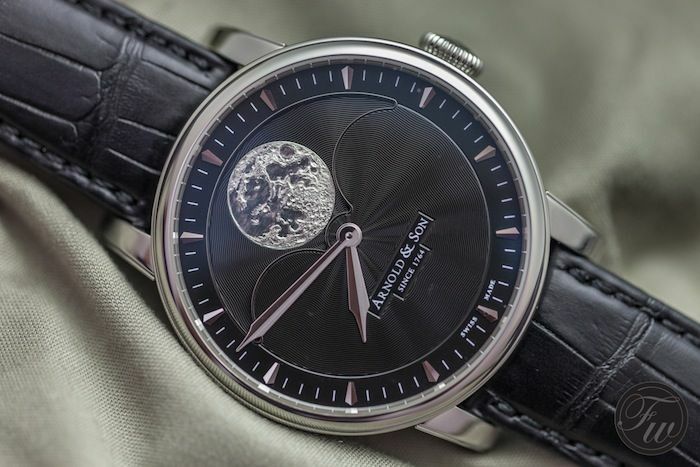 Their hand-wound caliber A&S1512 is beautifully finished but also hosts one of the most accurate moon phases complications available on the market. It only has a one day deviation every 122 years. When this time comes, your grand children or great grand children need to use the single-push corrector to keep it in sync for another 122 years. It goes without saying that caliber A&S1512 is all hand-finished, including manual chamfered bridges with polished edges, Côtes de Geneve finishing, circular graining and blued screws with bevelled and mirror-polished heads. As you can see on the photos, a transparent caseback lets you enjoy this relatively large (34mm) movement. 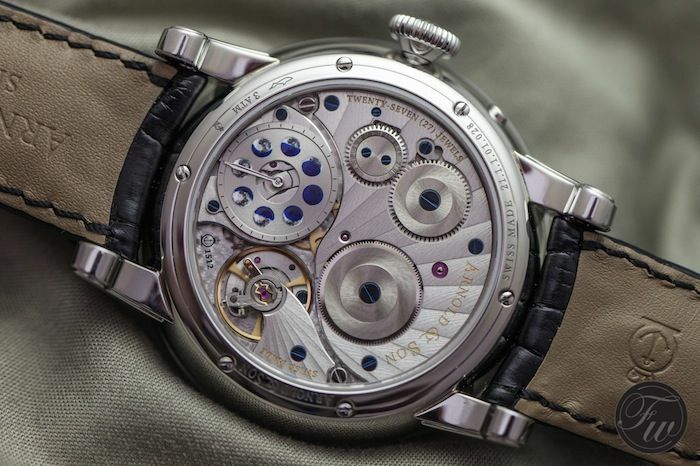 The movement is only 5.35mm in height and has a power reserve of 90 hours. Although the use of guilloché dials can become pretty ‘classic’ and too far away from modern wearable timepieces, Arnold & Son did a great job making sure the watch meets today’s requirements for a timepiece. The 42mm diameter case is just one example that it will suit most men’s wrists these days. Larger than 42mm or 43mm would make the watch perhaps a bit too tailored to the ultra modern men’s wrist watches, smaller would mean that a lot of watch enthusiasts and collectors would think it is too classic and not up to date with modern requirements. 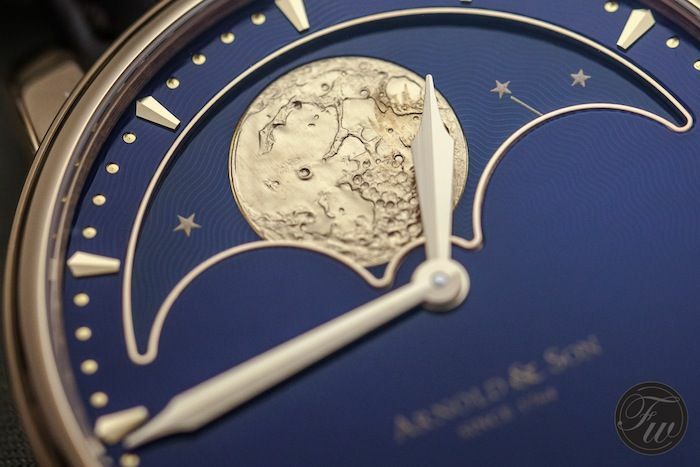 Especially since there is a great complication on the dial, in the form of a Moon disc, you definitely need some space to ‘show’. And space is what Arnold & Son is using to the fullest. 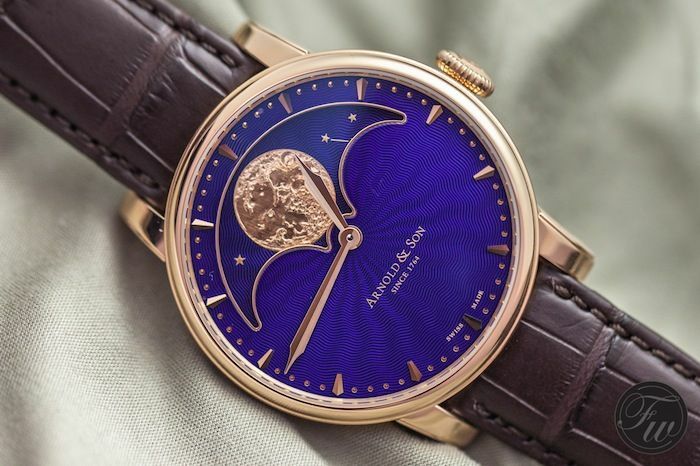 The Moon disc measures 29mm (diameter) and the Moon itself has been hand engraved and made out of gold for the red gold models, the stainless steel model has a silver Moon. 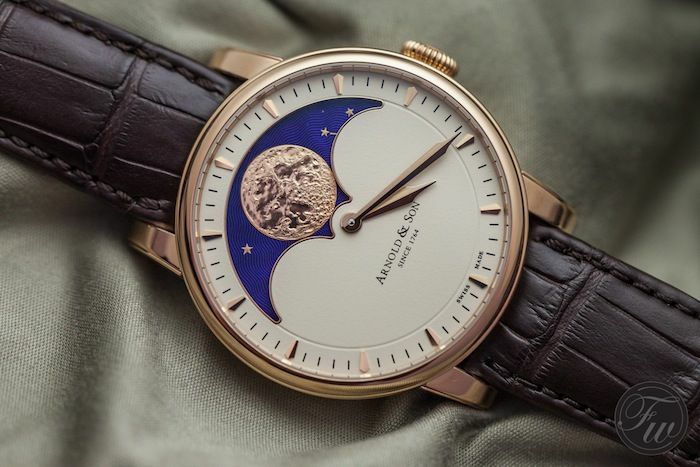 The hand engraved Moon measures 11mm in diameter, to make sure the wearer will enjoy looking at all the details whenever he wants without having to grab a loupe. The stainless steel version of the watch (reference 1GLAS.B01A.C122S) and the red gold version with the blue dial (reference 1GLAR.U01A.C123A) both have a guilloché finish as you can see. The cream dial version ‘only’ has a guilloché Moon phase disc, this is reference 1GLAR.I01A.C122A). All references of the Arnold & Son HM Perpetual Moon come on a hand-stitched alligator leather strap, either in black or in brown. 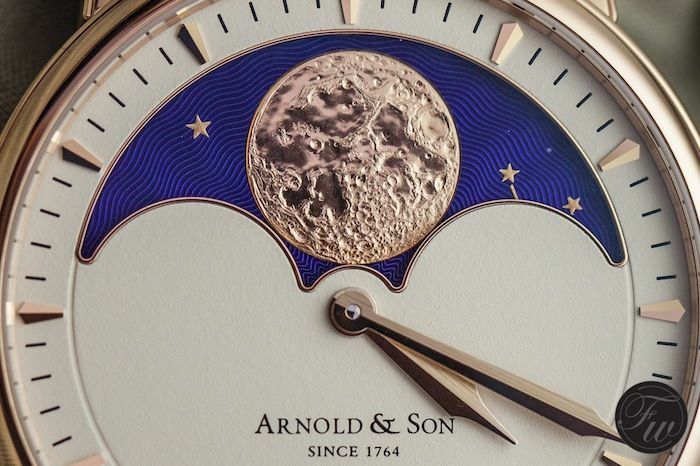 The HM Perpetual Moon timepieces weren’t the only novelties that Arnold & Son had to show us. I am pretty certain you have taken notice of their UTTE (Ultra-Thin Tourbillon Escapement) as well in the last few months. We have some pretty exciting photographs of that watch and some of their other ‘Instrument’ collection novelties as well. We keep you posted. In the meanwhile, make sure to go to the Arnold & Son website for more detailed overviews of their impressive collections.